LINDIWE RAKHAREBE has been the chief executive officer of the Durban ICC since 1st April 2015. 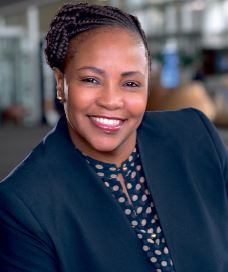 Her passion and dedication in growing the KwaZulu-Natal economy as well as her strong background in corporate management has helped to continue to propel the forward momentum of the organisation. Rakharebe said, "I am driven to achieve excellence in every way in my duty and delegation." The Durban ICC has made an immense contribution to both the provincial and national economies since its foundation. In spite of the challenging economic environment, the Durban ICC has managed to show a profit consecutively in the last seven financial periods. Rakharebe said, "I believe our continued success is a result of a concerted effort between our staff, our strategic partners in the City and Province and the loyal support of our clients. This, coupled with diligent management and sound financial controls at all levels of the organisation all help to contribute to the overall success of the Durban ICC. In addition, Rakharebe is well aware of the challenges of a being a woman leader in the often male dominated world of business. She commented, "As a woman, you are gifted; you are a natural life-giver and whatever you give life to will increase and grow. So whatever challenges you face as a woman, you know how to manoeuvre, whether it's leading a company or propelling a cause. I believe a woman influences everything she touches." Empowering others to achieve their highest performance by instilling confidence in all of her team is an important part of Rakharebe's daily activities. "I believe I have an ability to get the best out of people, enabling them to perform at their optimum. My staff tells me that I lead with love and respect. By loving and respecting my staff I hope to bring the best out of them, which ultimately benefits the organisation," said Rakharebe. "But the most important thing in remaining Africa's Leading Convention Centre is that we exceed our clients' expectations and provide an exceptional experience for each and every event we host," said Rakharebe. She continued, "I am proud that we had the opportunity to host the Africa's Travel Indaba, the world congress of the International Impact Assessment Association and the African Renaissance summit in May. Looking ahead, I am also excited about some of our upcoming events, including the World Travel Awards Africa Gala Ceremony, the International Union of Telecommunications Conference (Telecom World) and the BRICS Business Council." Rakharebe strongly believes that the Durban ICC has an important role to play in promoting sustainable economic growth for eThekwini including job creation. Rakharebe commented, "I would like to see meaningful enterprise development for SMMEs taking place at a grass-roots level. The Durban ICC has always recognised that the growth of the South African economy is largely dependent on the extent to which historically disadvantaged South Africans participate meaningfully in its growth. However, in order to grow it is also necessary to facilitate a positive future business development environment to attract both domestic and international investment in Durban and South Africa." "Whilst we celebrate all the good strides we have made in business, we must be mindful that there is still a lot more that needs to be done." concluded Rakharebe.